While I am waiting on Drew to catch up with posts from our Hall of Fame trip, I figured now would be a good time to show another one of the baseballs I bought while we were between signings. Actually, I am pretty sure I got this one between the last signing that we went to and the Hall of Fame parade. Things are a little fuzzy, I really should have jotted some notes down in my notebook. Anyway, I picked up my 89th Hall of Fame signed baseball (I misspoke when I said Killebrew was my 87th. Rickey - the one of him that I got in Columbia - was my 87th). "Happy" Chandler (b. 1898 - d. 1991) was a senator from and governor of Kentucky and the second commissioner of baseball, taking the helm upon the passing of Kenesaw Mountain Landis. Chandler was chosen as commissioner in part due to the team owners wanting someone with political ties to represent their interests in Washington, DC during World War II. Chandler was the commissioner when Jackie Robinson broke the color barrier in 1947. He served as commissioner of baseball from 1945 to 1951 and was elected to the Hall of Fame in 1982 by the Veterans Committee. When he died in 1991 at the age of 92, he had been the oldest living member of the Hall of Fame. The next legend we met during Hall of Fame Induction Weekend was Rickey Henderson. Chris tried to sneak in and get a ball signed by Rickey, but the handler immediately asked him for his ticket. I was so busy trying to get Drew's picture with Rickey, I didn't realize that Chris was trying to go two for two. I immediately did the right thing and went outside and bought a ticket for $109. A steep price, but I didn't want anyone to get into trouble. I also didn't mind because Rickey was really cool to Chris. They posed for a nice picture, as seen above. Rickey signed this OMLB ball on the sweet spot and I am going to upgrade the one I already had. 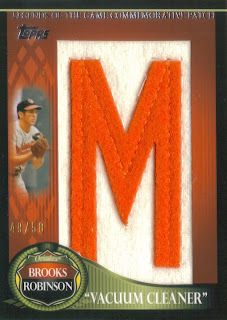 I plan on sending my old one to Drew so he can trade it to a vendor that he knows for a HOFer that I don't have yet. We'll see how it goes. It was really cool meeting Rickey. He was really nice and interacted with the fans going through the line to meet him. he was pricey but I think it was worth it to meet "The Greatest." Guest Post- Preparing to Relive the Trip of a Lifetime! Hey guys, William Drew back here! Wow, this is weird. Normally my writing is displayed over the green grass of a baseball field, but for this go-round I'm going to take my talents to the black backdrop! William and I just got back today from our Cooperstown extravaganza that I'm sure most of you have read about at some point or another this past weekend! He and I made the voyage along with his son Chris, brother Adam, and my dad, Joemama! We all had an awesome time touring the streets of baseball's most hallowed town, while meeting immortal players and taking time to visit their bronze plaques. Most of you have noticed how much William and I's friendship has taken off over the years. Believe it or not, we have now known each other for almost 5 years! I was 12 years old when I first inquired on his Robinson Cano autographed card, and from that point on, sports card blogosphere history was made! I like to think of it as one of the better stories in the hobby already, but I'm always looking for ways to make the fairy tale story even better. He's treated me so well over the years, and I honestly can't thank him enough for being there with me through the hardships of middle school/high school years. Let me tell you all now that you better all be ready to see some incredible stuff on this blog, better than what most internet sites have to offer! We have many great stories and memories to share and we want to include you all on this journey, because without all of your support in the hobby, who knows how much him and I's friendship would have developed. Despite him being one of my best friends, all you guys and girls reading have been awfully integral to my life- and I'm sure William can attest to that as well! With all of that stuff said, enjoy the next few weeks of reliving our awesome experiences and pickups with us! While we were at the card show in Cooperstown, I picked up this signed baseball by Tommy Henrich from the same vendor that I got the Harmon Killebrew from. I saw the Henrich and really liked it because of reading about him in the book The Glory of Their Times. Henrich was known as a great storyteller and I definitely could tell when reading that book. Henrich (b. 1913 - d. 2009) played in the majors from 1937 to 1942 and 1946 to 1950 for the Yankees. He had 1,297 hits, 183 home runs and a .282 batting average over the course of 11 seasons. He was an All Star 5 times and finished as high as 6th in the MVP voting (1948 and 1949). He won the World Series 4 times (1938, 1941, 1947 and 1949) with the Yankees. The first thing we did in Cooperstown was check out a card show that was in one of the buildings we saw as we were walking from our car. I remembered the place from the last time I visited Cooperstown, so when Drew suggested we check it out, I knew it would be a great place for us to get started. The first vendor we saw as we made our way into the building was a guy that Drew knew really well from his times at the White Plains, NY shows. The guy had a bunch of nice signed baseballs. The first thing the guy did when we walked in was notice Chris and give him a free ball. Chris picked out a signed Boog Powell ball. Because he did this, I figured I should at least buy SOMETHING from the guy, so I really concentrated on the stuff he had. He had a ball of a non-Hall of Famer that he wanted only $20 for (which I bought and will show later) and then I picked up the above Harmon Killebrew that I needed for my Hall of Fame collection. I got it really cheap (for $70 I think), so that was nice. It is a really good-looking ball with slight toning, but a great signature and HOF inscription. Killebrew (b. 1936 - d. 2011) played in the majors from 1954 to 1975 for the Senators, Twins and Royals. He had 2,086 hits, 573 home runs and a career .256 batting average. He was the 1969 AL MVP and appeared in the 1965 World Series (which the Twins lost to the Dodgers). Killebrew was elected to the Hall of Fame in 1984 (his 4th year on the ballot) when he received 83.1% of the vote. He is my 88th Hall of Famer. The first thing we did today while visiting Cooperstown (after checking out a card show, which I will talk about later) was to arrange for Drew to meet Pete Rose. As you can see above, Drew and his dad paid for a photo op with Rose which turned out really well for me too. As I was taking pictures for Drew, Chris snuck in there with a ball and a pen and got a signature from Rose. Rose was really nice to Chris and even fist bumped him after finishing the signing. The best part of the signing, though, was while we were waiting for Drew's photo to be developed, so Rose could sign it. Chris plopped down beside Rose, to which Rose replied, "Hey Chris!" Yeah, my son just sat beside Rose and hung out for a few minutes. It was pretty surreal, to tell you the truth. Chris was pretty bold to just take a seat there, but it was really awesome of Rose to acknowledge him and be ncie to him. Here is the signed ball that Chris got. I will hold onto this one for him. It's his ball, since he had the guts to just ask for it. I'm really proud of Chris for not being shy. This was such an awesome way to begin our day. Stay tuned for the first Hall of Fame signed baseball that I picked up today. I'm trying something new by doing a post with my phone. Good luck to me. I'm visiting my very close friend, Drew from Drewscards and we are currently riding to the National Baseball Hall of Fame. Last night, Drew took me to his local card shop. We bought a box of 2011 Topps Lineage so we could play pack wars. I won handily. Drew still made out ok because we did a bunch of trading afterward. I'll post some of the cards when I get access to a scanner but I will leave you with a few pictures from the break itself. I'm really enjoying my time with Drew. He is one of the first people I traded with back in 2009 through this blog. We have become best of friends and I am really excited to be able to experience the Hall of Fame him. I got a nice package in the mail from my good friend, Andrew, over at Andrew's Baseball Cards. He sent me some Tim Lincecum cards for my son as well as some Orioles for me. 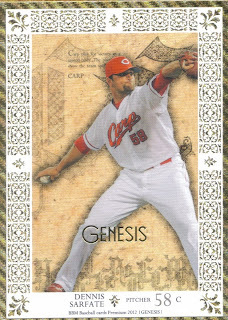 He also included the above Jaime Garcia Emerald for my set that I am trying to complete. I don't know how I missed this Adam Jones from Opening Day. 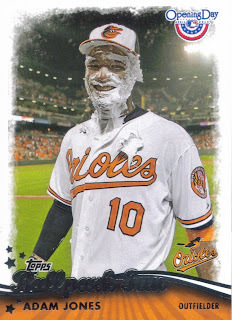 It's a pretty cool card; with the pie face and all. I remember when the pie face cards were the SP theme. I think that was 2010? I remember I had the Ike Davis. I'm glad I sold that one when I did. So, thanks for the package, Andrew! You'll have some Cardinals headed your way pretty soon, so keep a look out. After Scott and I finished out Gypsy Queen box break, he got some cards from his car that he had brought along with him. Among them were these two Orioles, the above Bowman Chrome Legends in the Making Dylan Bundy and the below retail exclusive foil Chasing History Manny Machado. I didn't have either card, so I was really happy to add them to their respective PCs. He also brought along a stack of other Orioles that I needed as well. I had already put a package of cards in the mail to Scott, so I didn't have any Red Sox cards to hand off to him, so I just had him go through a few of my card boxes and pull out whatever cards he wanted. I think he really enjoyed looking through my collection. When we were done with our trade, I brought out one of my PC boxes and let him and his dad look through some of my rookies and vintage. I think they were both appreciative at being able to see that stuff while they were here. I sure enjoyed being able to sit down and have some folks excited about looking through my cards. That's a rare thing around here. Yesterday was a really good day. I was able to spend the day with my very good friend, Scott and his Dad since Scott and I both mistakenly thought the Raleigh card show was this weekend. We had planned to meet up at the show, hang out as long as possible and then grab dinner afterward. Since we realized that we had the wrong weekend for the show, and since both of us would be unable to attend next weekend, we decided to meet up here at my house. Scott and his dad rolled in about a quarter to 11 in the morning, just in time to grab some lunch in downtown Greenville. After lunch, Scott, his dad, Chris and I all did a tour of the two card shops in the area. At the first card shop, in Kinston, Scott and I decided to go halves on a box so we would have something to bust when we got back to the house. 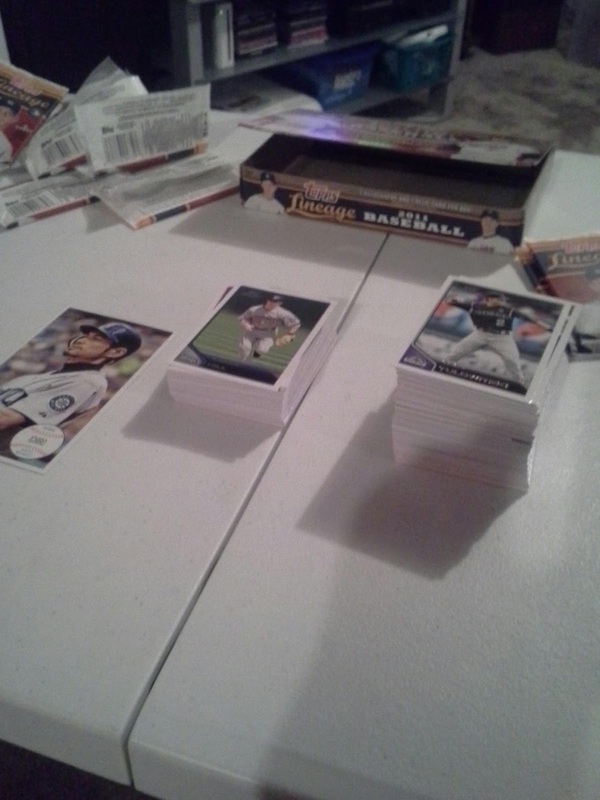 When we got back home, we split the box evenly and started ripping packs. Both of us made out with our packs as each got a relic and auto and several short prints. 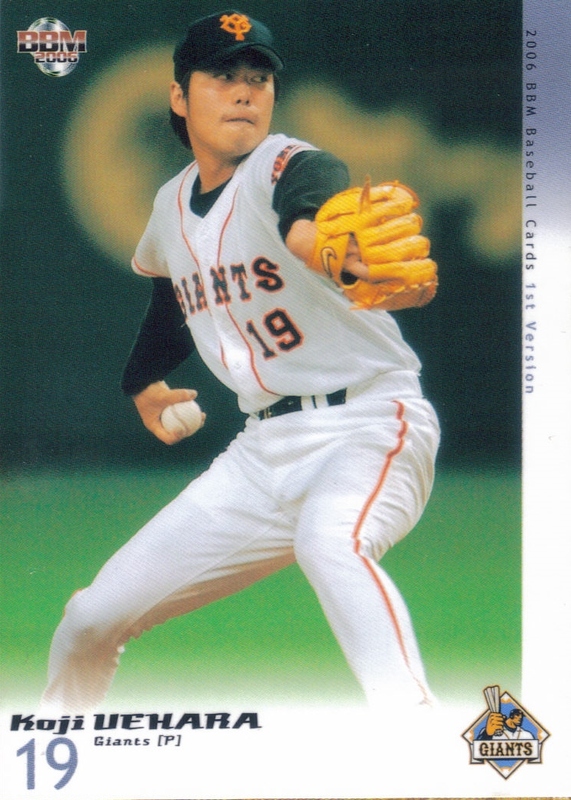 It wasn't until later that Scott texted me and told me that the Yu Darvish SP I got was, in fact, a super short print photo variation. Not bad. I think the odds of pulling one of those is 1:461 packs. Really not bad. I also pulled this sweet Matt Adams on-card auto. 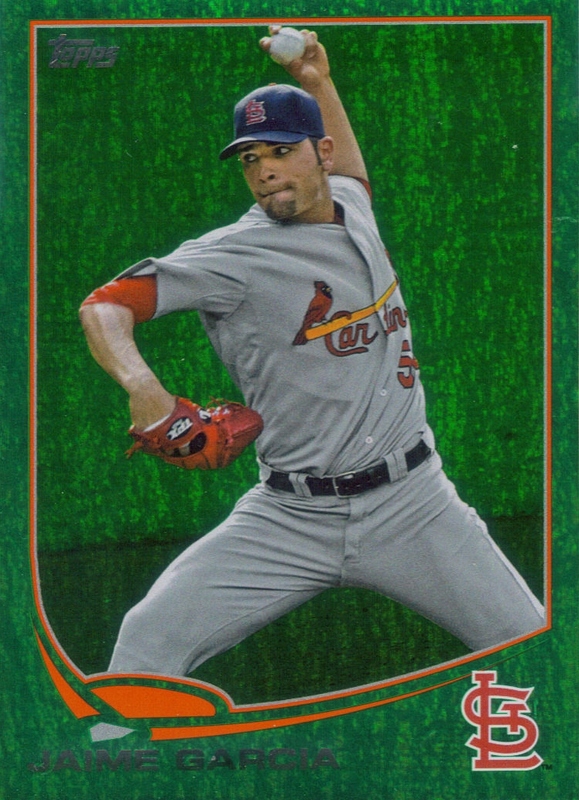 I know two Cardinals fans who are going to be fighting each other to get this card. The first one to email me and pony up some cash, will be the victor! In all, I had a really great day hanging out with a fellow blogger/collector along with his dad, who was awesome enough to bring along some of his own collection (which isn't baseball cards) for us to look at. It was really cool being able to sit around on the couch and talk about collecting, collecting regrets, auction sites, shows, etc. I think we all decided that this would become a regular thing, so I'm hoping we all can hang out really soon. Scott and his dad are awesome folks and I am so glad we got the date wrong on the card show. This was so much more fun! Go take a look at Scott's blog and give him some follows. he's a hell of a guy and deserves more attention for his blog! 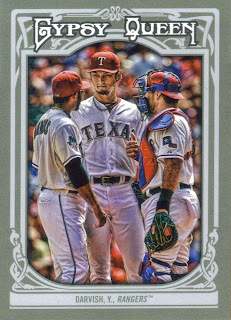 I love these Blue Sparkle parallels. I picked up this Brian Roberts off of Ebay for a couple bucks several weeks ago and am just now getting around to showing it. Roberts didn't play but 17 games last season so I was able to almost figure out which game this photo came from. It had to be either June 23 or 24, 2012 when the Nationals visited Baltimore. You can see Bryce Harper behind Roberts, who seems to be in shock at a call. Harper went 0-4 in the first game of the series (June 22). In the second game, Harper went 1-3 and stole second off of Wei-Yin Chen/Matt Weiters. That one could very well be the play we are seeing here. Unless, they took the shot during the June 24 game where Harper went 2-4 with a double and you are seeing that play. I really think this photo was taken during Harper's stolen base on June 23 because if this was from Harper hitting a double and a throw was coming to Roberts from the outfield, then he would be positioned differently and I don't think you would be able to see the advertisement on the outfield wall. I believe this shot was taken as Roberts received a throw from Wieters and was shocked that the call didn't go in the O's favor. You know, because Wieters is money when it comes to throwing out baserunners. 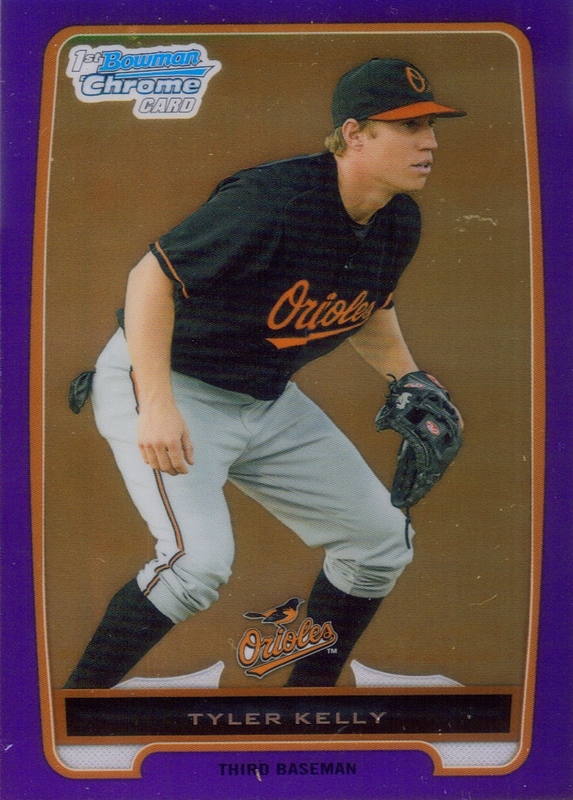 I got a surprise package from Cam (the writer of the fine blog titled The Bullpen Cardboard) the other day that included several Orioles cards. I have been trading with Cam for a long time. We might go 6 months without chatting, but when we pick things up again, it's like we have been talking every day. He is a really good guy who is aspiring to be a musician. We've gotten to be pretty good friends over the years, even though I can't get him to agree with me about how awesome Pearl Jam is. Oh well. 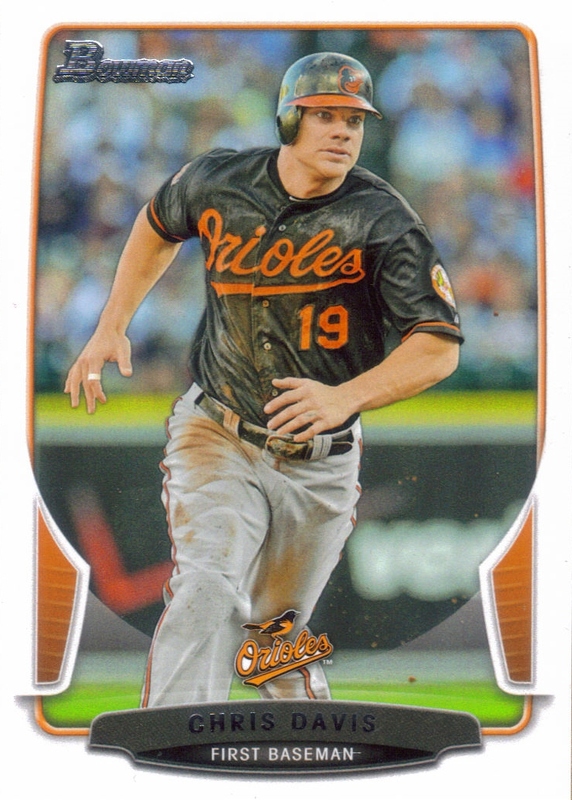 I really enjoyed the above Chris Davis 2013 Bowman. 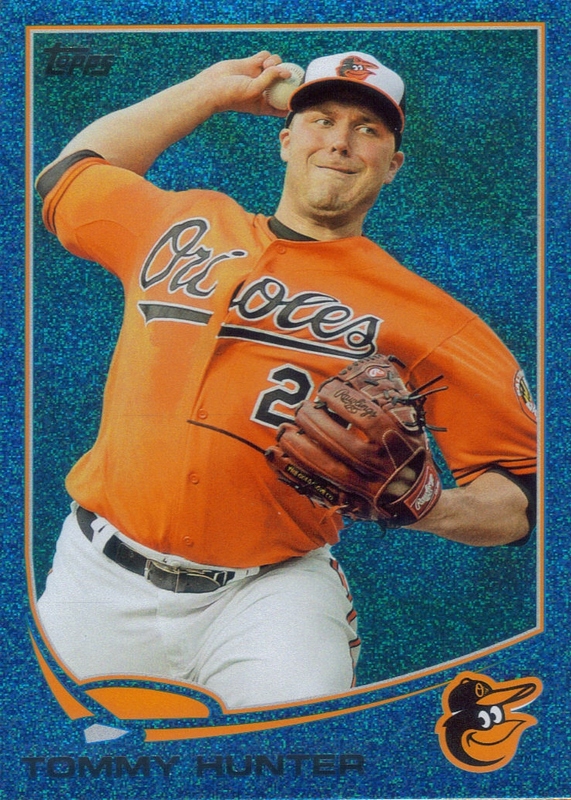 I pulled only Jim Johnson from the several jumbo packs that I bought, so I was very happy to be able to add this Davis to my PC without having to buy 500 more packs just to pull one. Thanks for making it easy on me, Cam! I made a new friend recently via this blog, which is something I truly enjoy. He just recently started a blog, Erik's Sports Cards, which I recommend you all take a look at and follow. 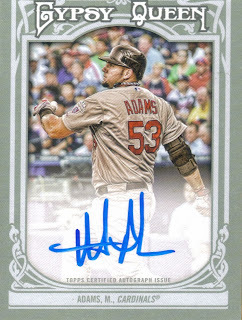 Anyway, after my box break of 2013 Topps Series 2, Erik emailed me asking if I had pulled the David Ortiz Boston Strong SP, which I hadn't. He had told me in the email that the card held a special meaning to him, so I took a look around online and found one on Ebay for a really cheap price. I picked up the card for him and sent it to him, asking for nothing in return. I'm not one who likes to broadcast my charitable endeavors because I enjoy just doing nice things for folks. Reading the email Erik sent me afterward and the post on his blog that followed was something I really enjoyed. I'm so glad that some small gesture on my part meant so much to a guy who is seemigly getting started in this awesome hobby of ours. Erik surprised me when I got a package in the mail today that contained this 2013 Topps Blue Sparkle Tommy Hunter. I sincerely didn't want anything in return for the Ortiz card, but I appreciate his thought in sending something back. The card is beautiful and Hunter's cremecicle jersey really pops off of it. Thanks so much for the card, Erik! I really appreciate it and I hope you continue to add to your blog! I finally added another letter to my 2009 Topps Brooks Robinson letter patch project. I've got to say, this project has been TOUGH! I went to the National card show last year and couldn't find a single one of these. I've been working on the project since 2009, obviously, and still, 4 years later, I haven't completed it. I only need 3 letters (C, A, R) after this one, but finding these on Ebay are few and far between. Here's to holding out hope that the last 3 cards pop up somewhere. I haven't given up yet! 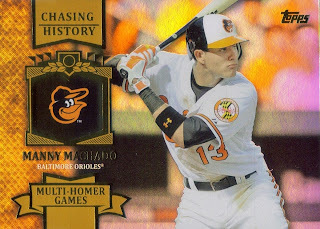 I went to the local card shop last weekend and saw that they had gotten in the new 2013 Panini Golden Age. I bought a few packs and didn't really get much of anything except for some horse racing cards. Something I did see, though was that another patron of the shop had busted a box and had a Bob Feller box topper in his box of stuff. I asked him if he was going to keep it or sell it and when he replied that he was going to sell it, well, I bought it, haha. 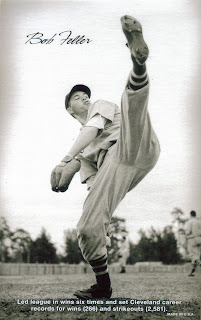 This is an enlarged card with the classic high-kick shot of Feller, which is such a great shot. I can just imagine the force at which that baseball is about to leave his hand. Yikes. The card just looks great and I'm glad that the guy was willing to sell it to me for 5 bucks. 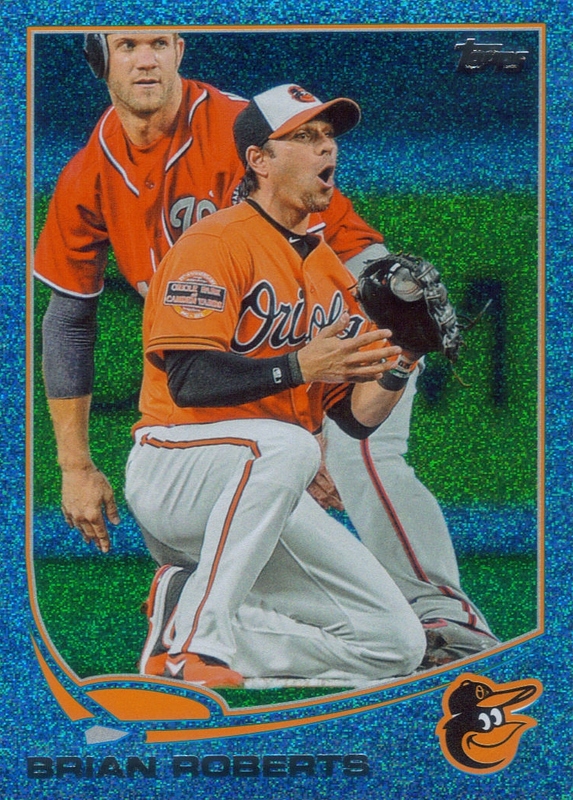 I wish Topps would do more box toppers. I received another trade package from Judson over at 'My Cardboard Habit.' 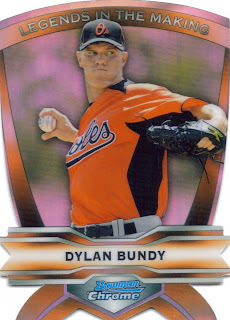 I had sent him some Rangers goodies and he returned the favor with a stack of Orioles from 2012 Bowman. You can see the above Kevin Gausman refractor, which is really nice, albeit crooked because of my scanner. I also got this really cool Adrian Marin orange parallel numbered 38/250. Not bad at all. 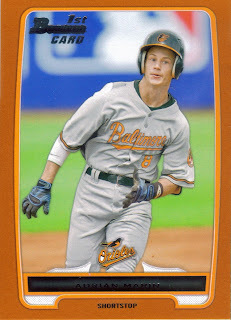 I like the Bowman offerings, except that I can never tell if it is Bowman or Draft Picks and Prospects, etc. oh well. It's all Bowman to me. Thanks again, Judson! Ever since Fan Fest in January, I have been corresponding with Michael, a fellow Orioles fan and autograph hound. Michael's a really nice guy who has an amazing collection of Orioles memorabilia. He also has very high standards for his stuff, so he goes out of his way to get all of his signed baseballs on OMLB balls, on the Sweet Spot. He doesn't mess around. He is also a very shrewd negitiator when it comes to trading, which, in turn, can be a lot of fun. You kind of feel like a GM when he presents an offer for something you really don't want to trade away. He always has compelling offers, so I generally listen when he comes calling. It also helps that he is genuinely an all around nice guy. So, when Michael found out I was going to be in Baltimore this past Monday, he presented me with a trade proposal for the above 2012 OMLB Camden Yards Anniversary game used baseball. This go-round, he was looking for cash considerations and we went back and forth until we agreed on an amount and he offered to throw in a signed baseball that you will see below. The Camden ball is MLB authenticated and after referring to their database, I can tell you that the ball was from June 10, 2012. The Orioles faced the Phillies and the ball was a foul tip by Shane Victorino off of Jason Hammel. Cool, right? The other part of the deal was the above Matt Wieters signed baseball. My Wieters ball from 2008 has faded quite a bit. I didn't know, then, about proper care for signed baseballs, so replacing it became a must. This one looks really nice, and it, too, is an OMLB baseball (when my other Wieters ball was not). Michael ddn't yet have Al Bumbry on a baseball, so when we got him at the autograph signing, I got one signed for him. He threw in the above Tommy John signed ball for the Bumbry. It isn't an OMLB ball, but it works fine for me. In one of the nicest gestures I've seen, Michael threw in three additional OMLB balls, signed by him! I thought it was a really awesome gesture. The middle baseball is, according to Michael, game used from one of his games. He hit a single that won the game. Michael is a really nice guy and I was really happy to complete this trade with him. 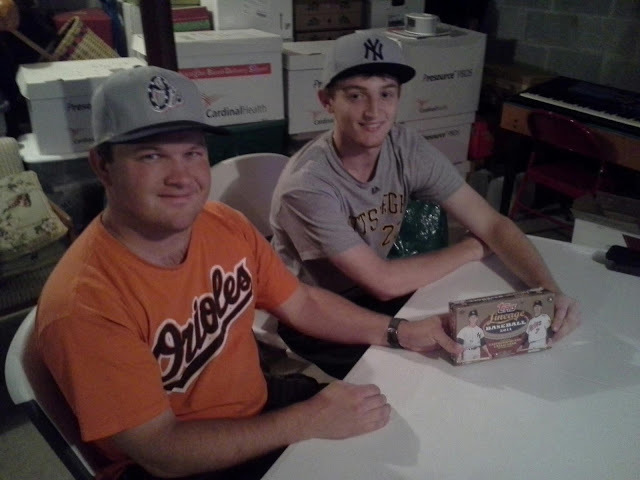 I'm sure we will meet up again and swap more O's related stuff very soon. I made my annual trek to Baltimore yesterday to see the Orioles lay an egg against the Rangers (the O's really are limping into the All Star break, uggh). On this trip, I took my son and also my nephew, Jacob. It was Jack's first major league game, so I wanted to make sure he had a good time. Luckily, when I picked up the tickets, I saw that it was going to be an Orioles Alumni autograph signing. We didn't know who the signers would be until we got to the game, but we lucked out and got Oriole great and former Rookie of the Year, Al Bumbry. Here is a pic of Chris getting a ball signed by Bumbry. Mr. Bumbry was nice enough to pose for a picture with Jacob and Chris, which was pretty awesome. There were supposed to be two other guys there (Fred Valentine and Ken Dixon) but they were unable to attend after getting stuck in traffic. They may have gotten there later, but we took Bumbry and made out way to our seats. Bumbry (b. 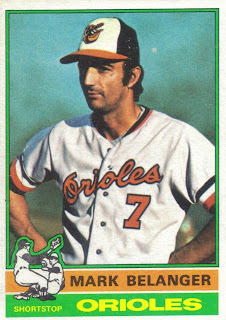 1947) played in the majors from 1972 to 1985 with the Orioles and Padres. He was the 1973 AL Rookie of the Year and won the World Series with the Orioles in 1983. He was an All Star one time (1980) in a career year that saw him collect 205 hits with a .318 batting average. In his career, he had 1,422 hits, 54 home runs and a .281 batting average. I added another cool piece to my Nolan PC recently when I picked up this 2013 Topps Nolan Reimold printing plate. It is the Cyan plate and i was tipped off to it by my buddy, Ryan. I got it for $7.50 (AMAZING!!! 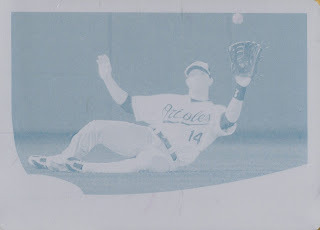 ), which has to be the cheapest I've ever gotten a printing plate. Well, you know, other than pulling it from a pack. 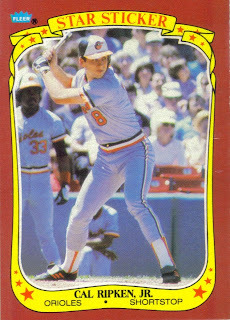 I completed a trade recently with blog reader, Jeff, when I sent him several 1987 Topps cards that he needed for his set. In return, he sent me 4 2013 Topps Emerald parallels that I needed for my set. 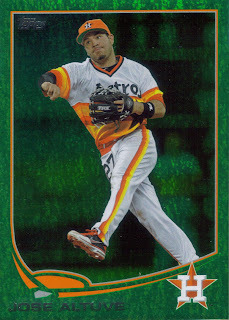 I chose to show off the above Jose Altuve because of the awesome Astros jersey that he is seen wearing. 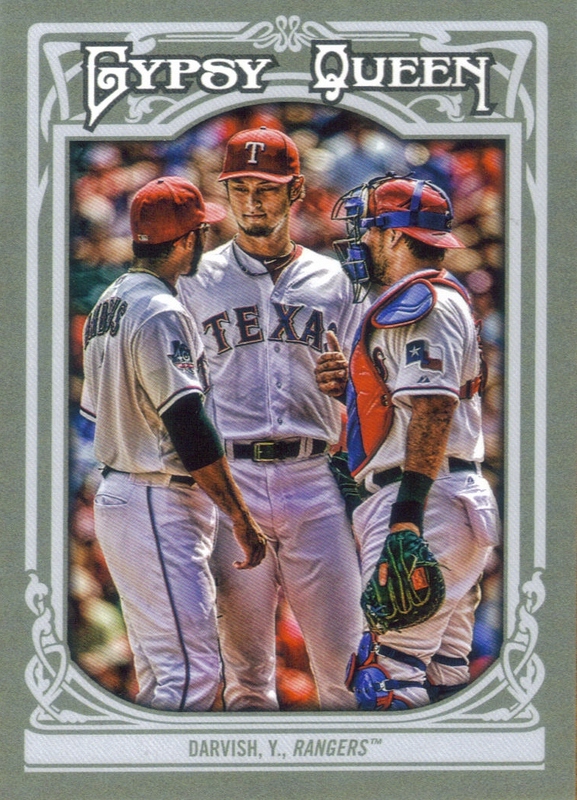 I still need a ton of 2013 Topps Emerald parallels for my set. I need too many Series 2's to list, so if you have any, I'll take them. My Series 1 needs are on my Wishlist, so please check it out and send me some more! I really want to complete this set. I feel like I'm doing well, I still have yet to buy what I need, so I think getting as far as I have by trading says a lot. Thanks for the trade, Jeff. Let's do it again! I got a really cool package in the mail the other day from Ryan over at O No Another Orioles Blog who recently took a trip to Japan. Among some of the Orioles cards that I definitely needed was the above 2003 Topps 205 Polar Bear mini. This is a really awesome card that scanned so well. 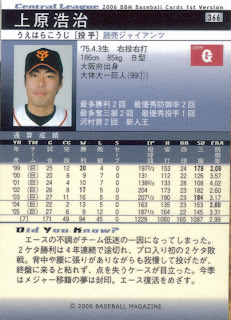 Ryan included some Japanese cards as well, above you can see the back of the Koji Uehara card that I got. I thought this was so cool! 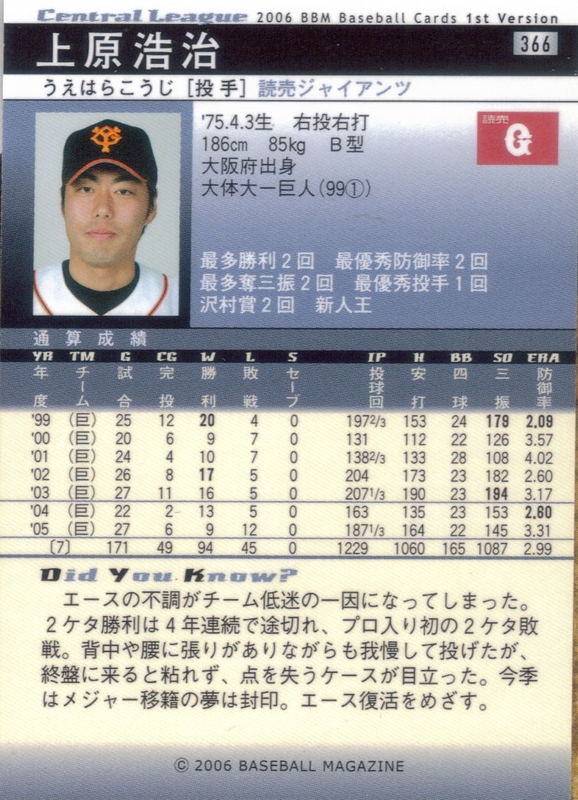 He also included Tsuyoshi Wada, Dennis Sarfate, Sherman Obando, Davey Johnson and a couple other former Orioles. 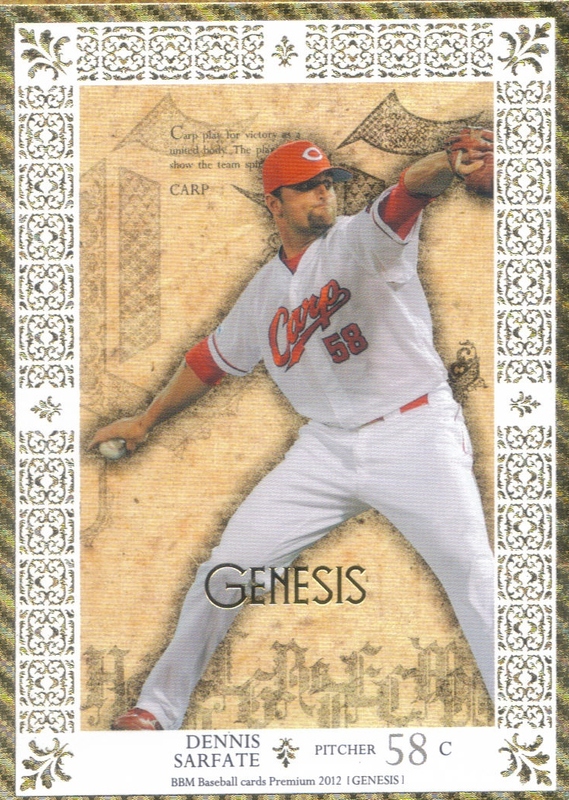 One of the coolest-looking Japanese cards that Ryan sent was the below 2012 Genesis Dennis Sarfate. This one looks so cool. I'm really amazed by the stuff Ryan sent. He's a really good guy and if you haven't traded with him before, you definitely should! Thanks again, Ryan! I really appreciated all of the stuff you sent! 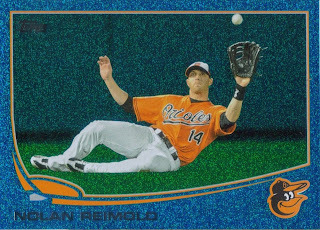 Today is the day that Nolan Reimold comes off the DL and is inserted into the Orioles' lineup. What better way to celebrate his return than to show off an absolutely beautiful 2013 Topps Blue Sparkle parallel that I picked up recently from Ebay. The Orioles mean business lately, having swept the division rival Yankees to completing a trade today to shed two under-performing pitchers for a AAA catcher and a starter who can help stabilize the rotation. 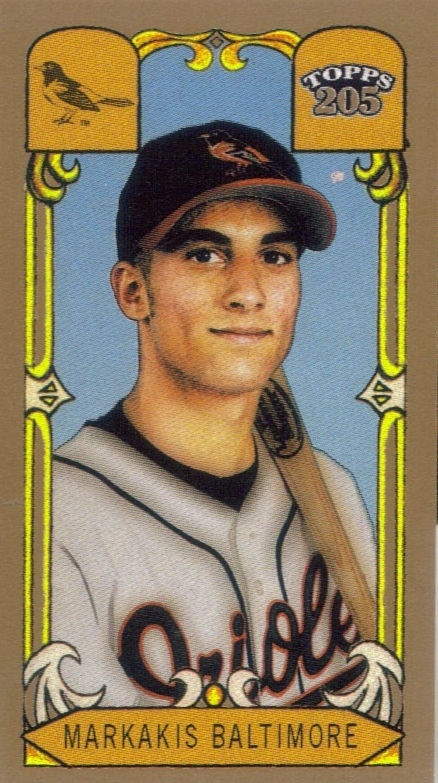 Also, the Orioles got back oft-injured second baseman, Brian Roberts. They will get Wei-yin Chen back off of the DL later this week as well. I'm really excited to see the team taking shape. I hope injuries can be dodged and they can really start to chip away at the Red Sox lead in the AL East standings. Reimold can definitely help. His hamstring issues appear to be behind him and he has moved further away from the major neck surgery he had last year. I really want him to come off of the DL strong and make an instant contribution to the team. Let's go O's! Never too early for a playoff push! I am feverishly working to catch up on all of the mail I've gotten recently (and a few more Ebay wins are on their way). That being said, I have been needing to post the awesome package Weston sent me the other day (I think it came in sometime last week). 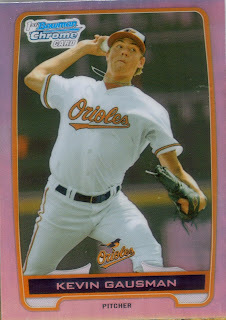 He sent a ton of Orioles cards for my and my son, Chris. There were a few vintage cards in the package, like the above Mark 'The Blade' Belanger. Belanger was an 'all glove, no hit' shortstop in his career. His life ended way too short when he passed away from lung cancer in 1998 at the age of 54. I'd love to say that I didn't already this 1986 Fleer Star Stickers Cal Ripken, but the thing is, and I've said it on here before, I don't know anymore which Cal cards I do and do not have. I feel like I didn't have this one as it definitely doesn't look familiar, but I guess I need to dig through my 500+ Cal cards and see if it resides in there or not. I'm so lazy. Finally, I got this sweet Ty Kelly 2012 Bowman Chrome purple refractor. Kelly was traded to the Mariners yesterday for Eric Thames in a move that didn't make a whole lot of sense to me. they have a glut of outfielders at AAA Norfolk and adding Thames just increases the logjam. That is, unless, another trade is in the works. Hmm, if it is for a legit starting pitcher, then I'm ok with it. We'll see. Anyway, I jumped off topic enough. Thanks for the package Weston!